Are you making money with your blog? Do you know that selling ads if one of the easiest ways to earn with a website? In this post, I’m going to talk about OneClerk, the new network which lets you monetize unsold ad space whilst you are waiting for ads to get sold on the AdClerks marketplace. Very important to know: an AdClerks account is required to use OneClerk. AdClerks (formerly known as PublicityClerks) is a completely automated and self-service platform that connects publishers with advertisers. As a blogger, you sign up to this marketplace to directly sell your ad space (or as an advertiser, you create an account here to find the best websites available on different categories and purchase ad space). Registration is free and very simple, it just takes a minute. There’s no sign-up or monthly fees, with absolutely no contracts. After you have created an account, add your website and AdClerks team will check it and eventually approve it. Here’s a screenshot of my blog Reviewz’n’Tips listed at AdClerks marketplace. Now, you want to decide what type of adverts you want, and how much you wish to be paid (either a 30-day monthly ad or a CPM ad with a minimum order option), creating as many ad zones as you want. There’s a selection of pre-set industry standard sizes that you can choose from, or you may want to create a custom size. If you are already using Adsense, you can backfill unsold ad space with it. Now sit back and start making money automatically! Note: you can set to get ad sales to be approved automatically or decide which one you want to approve or reject, before they go live on your website. Also, you can set up an on-site shopping cart allowing advertisers to buy ad space direct on your ‘Advertise’ page (managed via AdClerks). 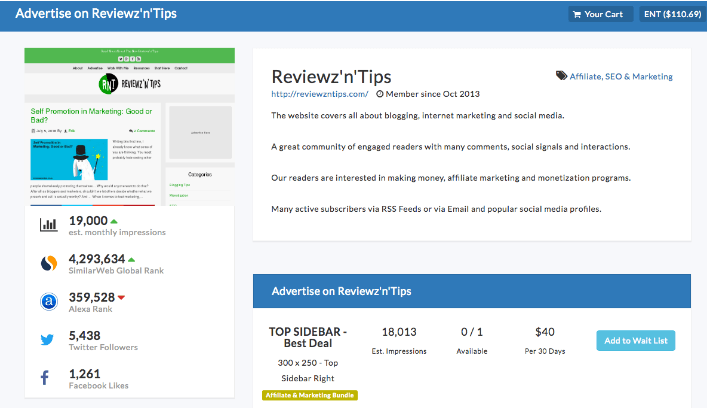 Here’s Reviewz’n’Tips advertise page, as an example. You may want to know that AdClerks has partnered with SimilarWeb to show the site rank, which is a website traffic scoring method developed by SimilarWeb to determine a website’s rank. 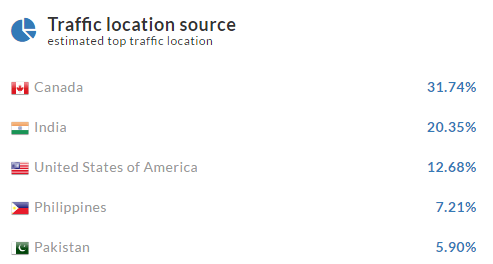 Also, AdClerks has developed GEO traffic location data to provide advertisers a top 5 list of traffic sources for each website. How Can You Earn More on AdClerks? I’m a happy publisher of both AdClerks and OneClerk, making money automatically from my best online properties. Use the latest ad zone code (the last update was September 30th, 2016) to be able to collect more impressions from your site. Be sure to optimize your site listing details. Things like an informative title, a proper description and related keywords help advertisers find you. Do not place too high prices or too many available ads. This will only scare advertisers. Just visit your similar websites of yours in the AdClerks marketplace to have an idea of how much ask for each ad space and how many ad spaces you want to create. Choose prime locations. Advertisers are more likely to purchase ad space above the fold or on top/best locations on your website. A footer banner is least likely to be purchased as opposed to a header or top sidebar ad. You may want to offer CPM ads. As an alternative option, advertisers may want to try out CPM, instead of a fixed 30-day monthly ad. You can also set a minimum order quantity to prevent small ad sales (e.g min of 10k impressions purchase). Always display at least one default ‘Advertise here’ banner. You don’t have to do this for all your ad zones, just do it for one of them. Create the on-site shopping cart. This is perfect for your ‘advertise’ page, as it allows advertisers to buy ad space directly without leaving your website (the whole process is managed by AdClerks). And for any other request you have, don’t hesitate to contact AdClerks and talk to an account manager to find out how you can successfully make money by selling ad spaces on your website. Your website should be live, finished and if applicable with frequent updates or content. Your website should be receiving more than 100k impressions or page views a month. If less, your website may still be considered based on AdClerks advertisers demand. Your website should currently have minimal advertising and feature a well designed layout or template (responsiveness is a plus). Your website should have its own domain and not be hosted on a free subdomain (e.g blogspot, blogger, weebly etc. are not allowed). Your website should be written in proper English. Your website traffic must not be generated from bot traffic sources or traffic exchanges (e.g HitLeap or any other traffic exchange systems are not allowed). Now let’s talk about OneClerk, the new way for bloggers to monetize their unsold ad zones, all while making the ad zones available to purchase on the AdClerks marketplace. OneClerk is a CPM ad network created just for AdClerks users which monetize your existing ad zones with just one click. Once you have sent the approval request and get your account activated, you instantly and automatically monetize any unsold ad space while still making them available to purchase on AdClerks marketplace. You can see then family-friendly, related ads with an 80% fill rate (of course, you can decide to opt-out at any time). First, once logged in, visit your OneClerk dashboard. To be able to opt-in for OneClerk, you need to create a 300×250 ad space. And the advanced settings (if needed). Just click on “Opt-in for OneClerk” and you’re done! Simply wait for the approval and start earning money by monetizing this unsold ad zone! I definitely suggest you create an account at AdClerks, if you don’t have one already. Submit your websites and then opt-in for OneClerk, visiting this page. I’m a happy publisher of both AdClerks and OneClerk, making money automatically from my best online properties, so I suggest you do the same! Now, I’d love to hear what you think. Do you have already an account with AdClerks or OneClerk? If so, please share your experience with them! Leave a comment below and don’t forget to share the post, if you liked it. Thanks! Hey Erik I never heard of Adclerks… I want to sign up! you may have heard of it with the previous name, “Publicity Clerks”. I’m a really happy publisher. Be sure to sign up and let me know how it goes! Feel free to hit me if you need any hints. I think http://www.trickyenough.com/ would be a nice fit on AdClerks marketplace. You can give it a go and eventually set Adsense as backup ads. I’ve never heard of either of these but did go over and sign up for AdClerks. I’m assuming once I get my approval, I’ll be able to create my ad in OneClerk. Very cool stuff! Thank you for sharing it with us! You rock! Cool, be sure to sign up and submit your site. You will have plenty of control on the ad sales. Thanks for checking the post, much appreciated! It’s indeed a great JOY to be here again in the beginning of yet another New Year. I am so glad to read about this platform, Looks like an amazing platform. Thanks for telling it in detail, I would like to join in. May you have a wonderful and profitable year ahead. Thanks for stopping by and checking the post, Phil. Hi Erik, thanks for sharing this one. I just signed up, it looks really neat. I don’t do any ads at the moment on my site and want to keep it clean. I hope this is the perfect solution 🙂 Have a great day! Good luck with that, Lisa. This is a super cool and seamless process, which seems like quite the change up to other ad networks I’ve peeped. Thanks for checking the post, Ryan. I hope you can join both AdClerks and OneClerk. Once again you have shared very interesting post with us, I appreciate your effort. This is really helpful for me to get some extra money to sold unused ads zone. I glad to know about the oneclerk and like to used it once. Glad you enjoyed the post about OneClerk and AdClerks, Junaid. I hope this can help you make more money with your website. Let me know how it goes! yeah ! you are right, I have bookmark this and create account on sunday because, sunday is my work day and I have create all content and other accounts for my blogging site ::) after using this I will again comment and tell you about my experience. I look forward to reading your experience with AdClerks, Junaid. As modern world is going digital day by day, almost every business is trying to come online and start taking the benefit of it. The majority of this business is new to this field, so they choose online advertising in order to grow there business rapidly. It is the vital reason that advertising has became an integral part of marketing domain. When it comes to advertising, online advertisement can never be ignored. By realizing it’s importance many of the companies have taken it on shoulder to serve advertisement on behalf of businesses. One among them is AdClerks, really it is a CPM based ad network. Eventually, thanks for sharing your best experience regarding this subject in deep. Have you joined AdClerks, Amar? Thanks for writing the complete details about AdClerk & OneClerk ad network, This is the first time I’m hearing this ad monetization network and its features seem good. I would like to join and try earning from Ads. However, the people are using Adblockers to avoid popuping annoying ads and hence the bloggers struggle to make money with Adsense. Anyway, if we use the theme like Ad-Sense from MyThemeShop, then we can show the ads to the visitors. Good to learn some helpful stuff from your nice piece of content, Erik. Keep your good work. I’m a happy AdClerks and OneClerk publisher. I hope you can get your site approved in their marketplace and start earning selling ads. Thanks for checking the post and suggesting a theme like Ad-Sense from MyThemeShop. I’ll definitely take a look at it. Have a good day there! I never heard of Adclerks. Will sign up soon and see how useful it is. Thanks for sharing the details about it. Be sure to submit your site, Kuldeep. Hey Erik, I never heard of Adclerks… I will sign up today and will share experience on my blog. Good luck with the submission, itender. Well I have never heard about oneclerks and seems like its really great platform for publishers to earn some extra bucks. I will surely signup there now. Working great for me, Rajkumar. Let me know your experience with AdClerks and OneClerk once you’ve tried them. Join AdClerks and OneClerk, Aqib. And tell me your experience, then! Thanks for sharing the OneClerk review. I was just wondering, did you join this network? Is your site approved there? If yes, then please let me know why you’re not using them to monetize? I hope you’ll clear my doubts! and also with five of my niche sites. and according to their guidelines, I can not join any similar network. I am familar with lots of adsense like sites, but AdClerks is new to me. I will definitely make a try. Thanks for checking my OneClerk and AdClerk review, Manoj.